Celebrating the musical career of stage and screen legend Dame Julie Andrews. Dame Julie Andrews is widely regarded as one of the stage and screen’s most legendary performers with a career spanning over seventy years! Join us for this second-to-none, startlingly realistic tribute of her most beloved roles from some of the nation’s favourite musicals. Featuring songs from My Fair Lady, Camelot, Mary Poppins, Thoroughly Modern Millie, The Princess Diaries and of course, The Sound Of Music as well as many more. So, if these are a few of your favourite things then come along as we celebrate one of musical theatre’s most iconic performers in a night full of music and joy. 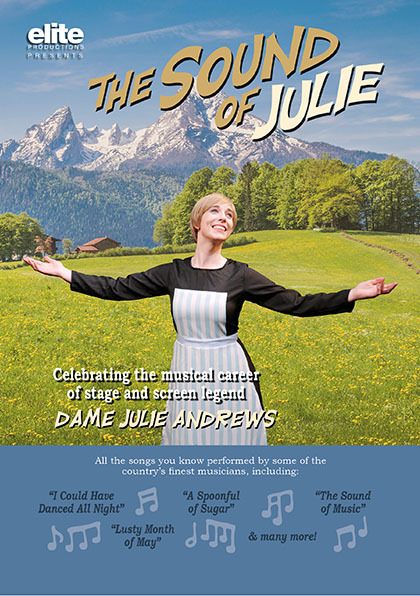 With live music performed by some of the country’s finest musicians and an ensemble of backing vocalists and dancers, The Sound Of Julie is practically perfect in every way.